When you were in school, you were told you need to learn how to do math the hard way because "you won't always have a calculator on you". Well, while we now know that your math teacher was about as good at forward-thinking as the dude who said no one would ever need more than 640k of RAM, there has still always been the problem of more complex expressions, including using constants, fractions, exponents and whatnot. 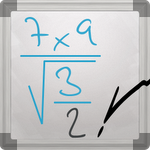 Well, while this app won't replace your education on how those concepts work, MyScript Calculator lets you draw your problems rather than type them, making it much easier to get answers to less-than-straightforward expressions. The handwriting recognition is superb, especially given that, unless you have a Note, you're probably drawing these on a tiny screen with the tip of your finger. The one problem I did find it consistently has is that it keeps trying to interpret my typical 4, which I write the way it's displayed on a computer, with a closed top, as either 1- or a + sign. This is frustrating, though using an open-top 4 seems to alleviate this problem. 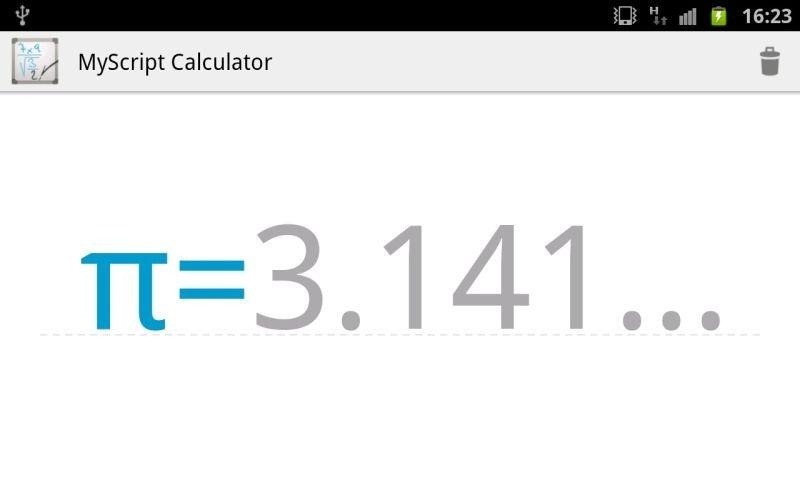 The app is pretty fantastic and should be a godsend for folks who need more than a standard calculator can give them. As Artem said when he first discovered this app: "I love the future." 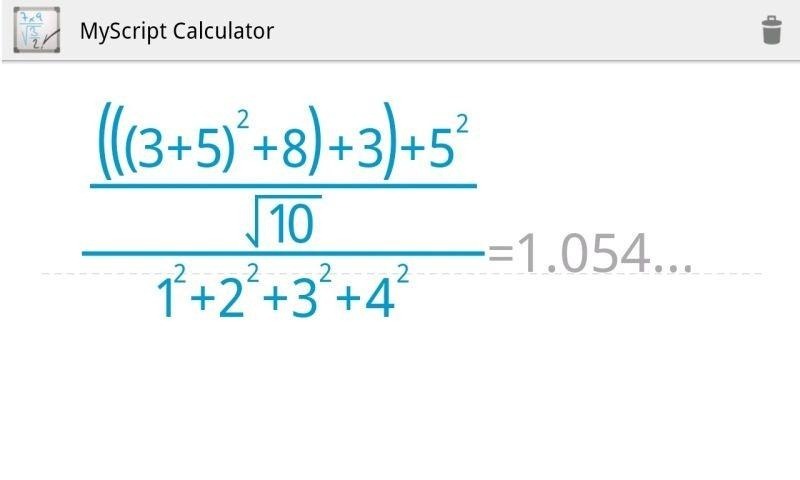 Currently, MyScript supports mathematical symbols +, -, ×, /, √, Pi, parentheses, and exponentiation. You can also cross out stuff you've already written to erase it. I'm hoping support for more complex expressions as well as solving equations will be coming in the future (maybe as a Pro version). 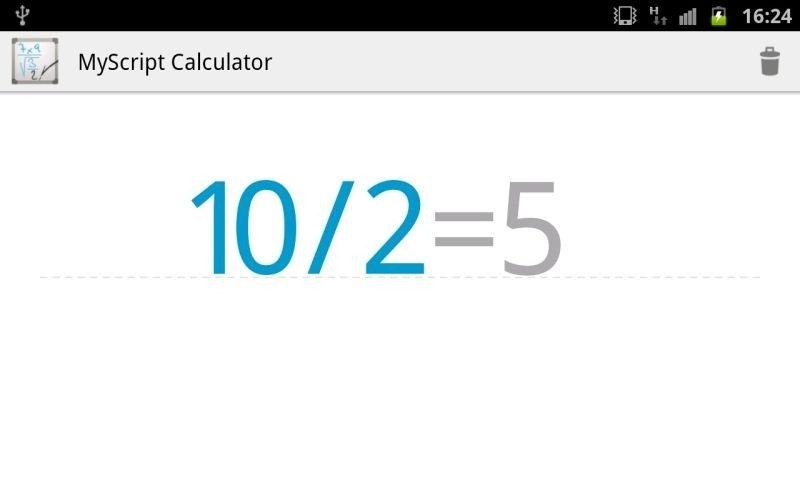 Grab it from the Play Store now and then forward it along to your high school math teacher.